In the Cold War world of the 1950s a flying saucer lands in Washington, U.S.A. and from it come Klatu, a human-looking extra-terrestrial and his enigmatic, powerful robot. His efforts to meet all the heads of state on Earth at once, because their petty bickering prevents their agreement, he goes into human society. Visitor: So long as you are limited to fighting among yourselves ... we were unconcerned ... (but) a threat to the peace and security of other planets .. that of course we cannot tolerate. Will the strange alien destroy the Earth, or will the winsome young Bobby, the innocently curious professor, and the real nice folks at the boarding house convince him that humans a just as nice as can be, really? Will the naming of the space man "Mr Carpenter" a titch obvious? Scientist: I have several thousand questions for you. It's not all paranoia and shoot-em-till-they-glow. The dialogue has a few sly gems and the soundtrack is moody with a hint of other-worldlyness. Insurance Salesman: I don't care about the rest of the world. You'll feel different when you see my picture in the paper. Directed in black and white by Robert Wise, The Day the Earth Stood Still is well worth watching. Although the movie posters are classic SF bodice-ripper-robots posters, the story is thoughtful and played straight by the cast. Your choice is simple: join us and live in peace, or pursue your present course and face oblitoration. The decision rests with you. Fifty years on, world "leaders" are still pushing for option 2. 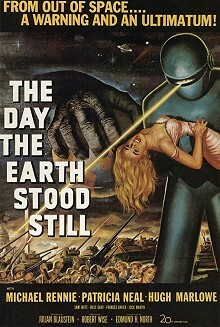 2008's Day the Earth Stood Still replaces the innocent 'pure' Bobby with a war-mongering little hate-nik. We make more colourful films these days, but it's through a lens darkly.